This is the first Deepdale Puzzle Room, and we are really looking forward to seeing whether our visitors and crew are up to the task of completing the lost professor�s research by solving the puzzles. Your team of 3 to 5 people needs to arrive just before the time slot you�ve booked. Harriet will give you an introduction to the puzzle room and how to use it. Your team will then have 30 minutes to solve the puzzles and break the curse. Teams who complete all the puzzles will be given a certificate of their time. The winning time over the week will win a bottle of Black Shuck Gin from The Norfolk Sloe Company and a Deepdale camping mug for each member of the team (we can post these out to you). Teams who fail the Halloween Puzzle Room will be cursed ... You can decide how long the curse lasts and the actual effects. The Halloween Puzzle Room is part of Deepdale Games, which are organised by Harriet, one of the lovely Deepdale Backpackers & Camping crew. Thank you to The Norfolk Sloe Company for their support with this event. 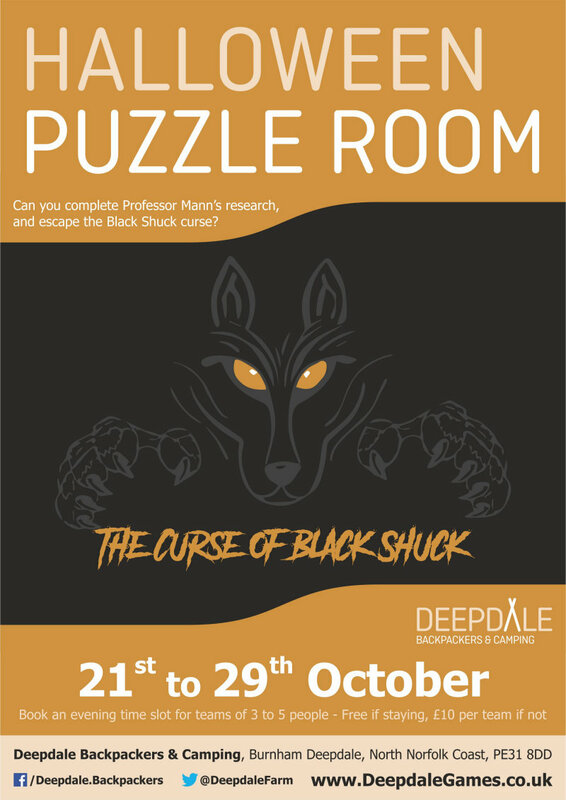 Halloween Puzzle Room - Curse of Black Shuck - Can you break the curse of Black Shuck? Complete the research of the lost professor by completing the puzzles to avoid the curse!